Well, it's the missing section of M42 at the northern end. The great big gap that's nowadays filled by the A42. Perhaps not, no. Whilst it's true to suggest that A42 is a downgraded M42, it's not really true at the same time. Do you get all excited by talking in riddles? Let's try and make sense of it then, being as you asked so nicely. From March 1976 onwards, a road was planned along the line of the A42. This road was assumed to be a continuation of M42, and indeed was regularly described as "M42 Castle Donington Section" by the Government. However, they insisted that no line was ever firmed up, and it lived in a kind of limbo. Not quite cancelled, but not quite "on" either. Then, all of a sudden in January 1982, the cut-price A42 was born. The cut-price nature of the road is blindingly obvious from a trip along it. It's just... rubbish. 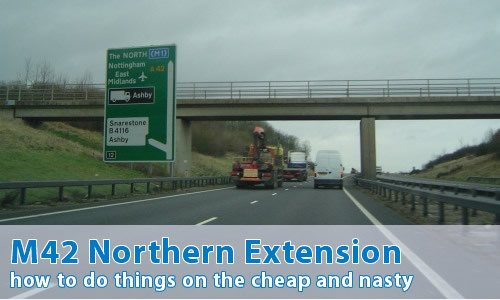 There's even a story that the Ministry demanded that all of the bridges were built too narrow to allow for any upgrade to motorway to take place easily. It's a classic example of everything that's bad about British transport planning. Even the Government's study into the route has come to the conclusion that it's just rubbish, and concluded that it should be upgraded to motorway as soon as possible. That was in 2003, and as of 2009, three quarters of nothing has happened. There is one slight question mark though. If no route for the M42/A42/B42/X42/Z42 Castle Donington Section was selected between 1976 and 1982, then how does a Ministry publication regarding the M64's demise and replacement by A50 have a map in it, with a junction marked "M42" in exactly the place that today's A42 is? OK, so it's true that the A42 is a downgraded M42. Now, why are you wittering on about it not being true? In 1971, the M42 was born, and lo, it went from M5, to M6, and then all the way to M1. In fact, it's completely recognisable as the road we know today (well, bar the Strensham - Solihull Motorway junction, anyway!). Except, that something very strange happens at the present junction 11. You know, where the M42 dies a horrible death today. Instead of lurching off to the east in a desperate bid to get to the M1 as quickly as possible without looking too stupid, it follows a far more sensible line, passing west of Ashby-de-la-Zouch and Melbourne, finding its way between all the towns on the way, before passing the A52 near Risley and meeting the M1 just to the east of the village of Stanton-by-Dale pretty much at that convienient bend in the M1. At this point, most commercial maps that show the route of M42 stop short. And lo, it met the M1 and all lived happily ever after in paradise. Or something like that anyway. It doesn't, however, tell the whole story. The M42 would have had a relatively short section to the east of M1, meeting the junction of the A609 and the now-A6002 near Trowell Moor. Why this should be so is currently lost in the mists of time: the A609 in these parts isn't exactly the most important route in or out of Nottingham, and the A6002 was just a B road. Perhaps it was to get an alternative route into Nottingham that didn't involve the already busy A52?